Get a $25 Restaurant.com gift card for just $2! You are here: Home / restaurant deals / Get a $25 Restaurant.com gift card for just $2! Restaurant.com has a HOT promotion right now: you can save 80% on Restaurant.com gift certificates, which means that a $25 gift card to some locations will only be $2! This promotion is valid through 11/15/11. 2. Enter your zip code to search for restaurants by location. Choose a certificate and click on the green “Add to Cart” button. You can also get a $25 Restaurant.com gift certificate for us at a later date for as low as $2 after the discount! 3. When you add items to your cart, make sure you enter the promotional code “HAM” in the yellow discount code box at the top of the page. Complete the check-out process. You can also get 35% cash back when you shop through ShopAtHome.com. If you are new to ShopAtHome.com, you will also get a $5 cash back bonus after your first purchase, which means your gift certificate could be FREE! I often get questions asking how this works or if it’s really a good deal. It is for me. Here’s an example. A local restaurant we have been wanting to try has a $25 gift certificate for $20. The “fine print” says that you have to spend at least $35 and that 18% gratuity is added. Given thecost of food at this location, we would easily be spending $35 anyway. Spend $4 + $10 (because our total would be at least $35) and $6.30 for the 18% gratuity – we’re getting a meal that would have been $41.30 with tip for $20.30. That’s basically half price! Sounds like a good deal to me! Get a $25 Restaurant.com gift card for as low as $2! 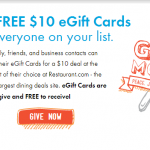 Get a $25 Restaurant.com gift card for $2! Get a $25 Restaurant.com gift certificate for just $3! Get a $25 Restaurant.com gift card for as low as $3! Get a $25 Restaurant.com gift certificate for as low as $1!